There are two types of scripts used in Czech registries. Older one is humanistic cursive which is related to our writing, newer one is kurrent (or neo-gothic cursive) which has different lines and draws. 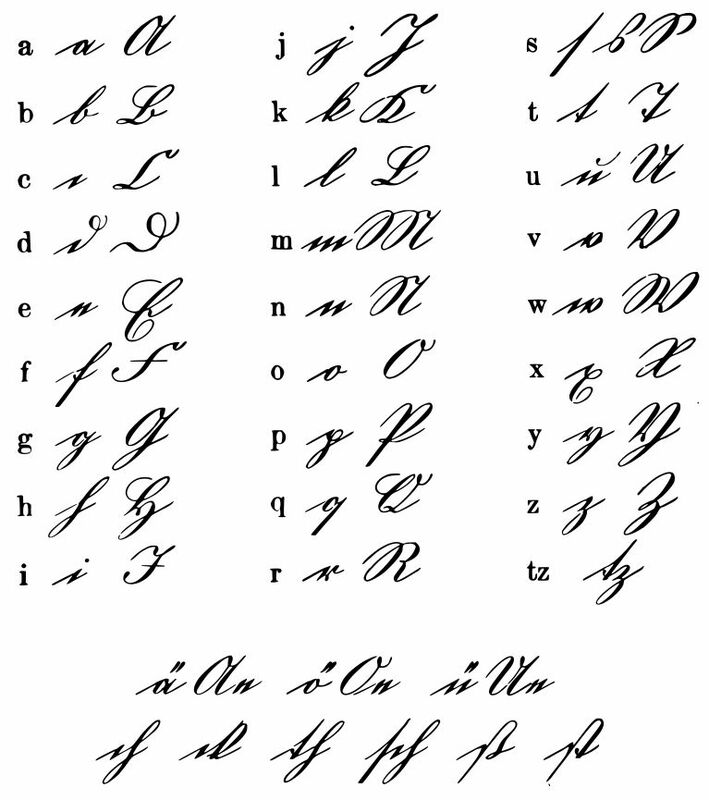 Humanistic cursive was used in Latin records (whole time) and in Czech records since the 2nd half of 19th century. 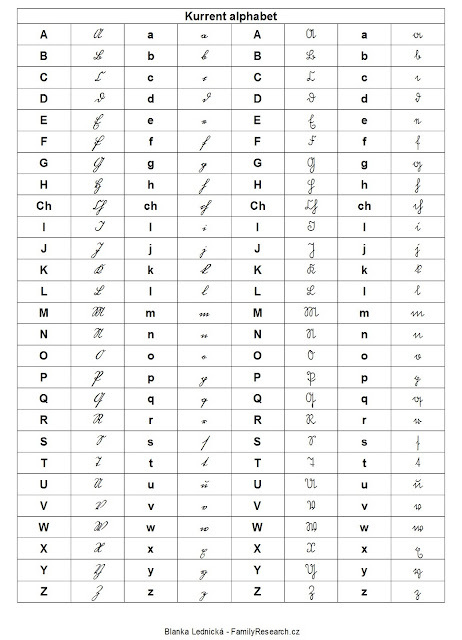 This script is based on Latin script and is very near to the handwriting scripts we are using today. It is easier to read and we are able to handle it more or less without problems. 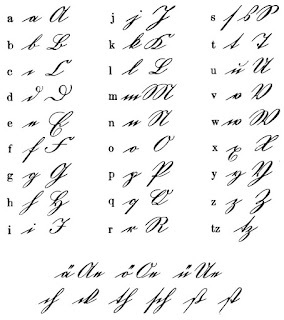 Neo-gothic cursive, also called kurrent, is different script. It has it's origin at the end of medieval ages. It is used in Czech documents since beginning of 16th century and it was used for Czech and German records. The lines of this script are bit different from the humanistic cursive and therefor are harder to read because the lines of the script are not natural for us. This table is composed by calligraphic form of the letters. You must take into account that not all vicars and their cooperators used the calligraphic form. The writing was also changing, one person uses another style in 25 years and another in 60 years of age. It needs lots of training to be able to read in the registries. That is a very handy chart. I spent a day going thru searches and links to find one similar. The old records I am searching are written in Current even here in Pittsburgh Pennsuylvania USA. It is just like today, although you have the records there are different writing styles in the same alphabet. Exactly - even in one language different people write in different style. but I'm sure there are other websites that probably have it too. Love your website - it is very helpful. Someone just pointed me here on my post about my recent browsing through old Czech parish registers to find my wife's ancestors. This will come in very helpful. Thanks. Ken: The PC fonts are great because you can see how the word should look like in the "nice" writing. And it's easier to read it in the "awful" writing. Brian: Good luck with your research! There is a really good tutorial here on Kurrentschrift (old German writing) and the example texts at the bottom of the page are very useful. The more you practice reading these old records, the easier it gets. Good chart for those ones who is looking for different versions of Latin fonts, including latin serif fonts. keep going! looking forward to new posts! One of my ancient ancestors has the surname of "Conczella." With the letters "cz" in the name I wonder if the name is basically Czech in origin. My grandfather was living in Rengersdorf, Silesia, Prussia, when I found him. He was born about 1797, where, we don't know. He died in Silesia. Can you help me with this puzzle? Thank you. Wow, thank you very much for this, Blanko! I wish that I'd found this earlier. 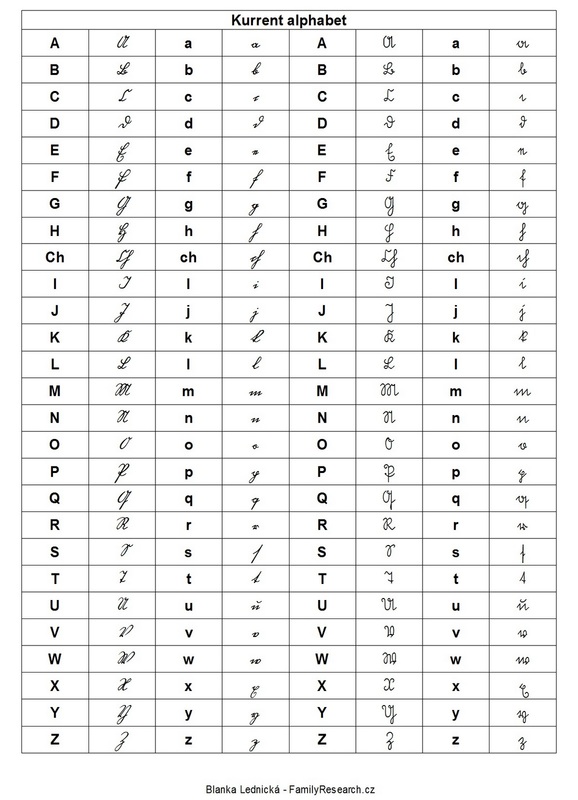 I spent many hours trying to decode the handwriting in matrikas. At first I thought that the writer just had a horrible handwriting, but then I noticed that it was very consistent, leading me to believe that their writing is simply something different than what I am used to.